These last few years, solutions to bring solid state power on 23cm were limited to only well-known MRF286. In 2014, DF9IC has presented a real new alternative by using GSM base station LDMOS MRFE9S 9160. This device provides around 150W at -1dB compression point at 900MHz and Henning find out the solution to get good matching and power performance for 23cm. This description below presents the design of 23cm power amplifier by using 4 of such devices. 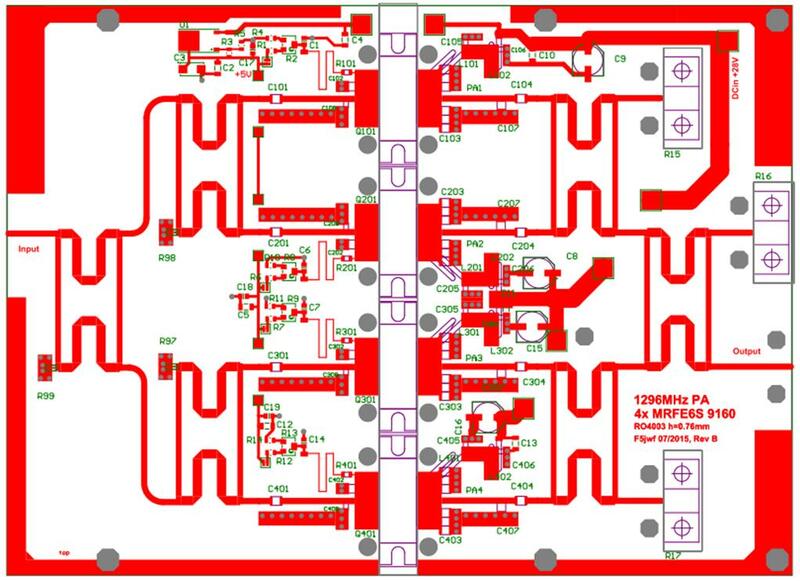 The basic design of Henning was presented in 2014: "Neue LDMOS-PA für 1296MHz Süddeutsches SHF-Treffen 05/2014"
The RF schematic is shown in Figure 1. My approach was to start with this design and try to optimize layout and mechanical dimensions to reduce the size of x4 assembly. My optimized layout is shown in Figure 3, it fits into a Shubert box: 72mm x 54mm. From this brick, few alternatives were possible, 2 or 4 transistors. 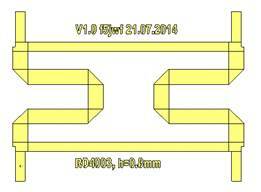 Hennings propose 2 transistors version, contact him for any information. 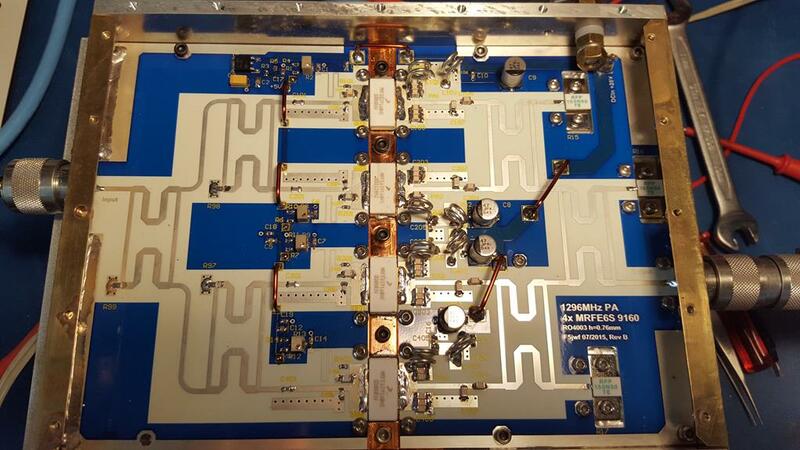 On my side, I have focused on a version with 4 transistors to reach 500W in a compact design which can be integrated in my EME antenna. The diagram of Figure 1 is repeated four times in the 4-transistor design presented below. On all of these versions of PA, the transistors are soldered on a solid copper plate with a Eutectic melting at 138° (Edsyn CR11, Sn42Bi58 see BOM for supplier). This operation is delicate but very achievable with a hot plate set at this temperature. Be careful that such device don’t live at all too hot temperature don’t heat them above 150…160°. The PCB is manufactured in two distinct parts then is screwed on each side of the copper plate and then gate and drain soldered. The MRF6S 9160 are currently available on Ebay at utsource for about 10 ... 15USD. 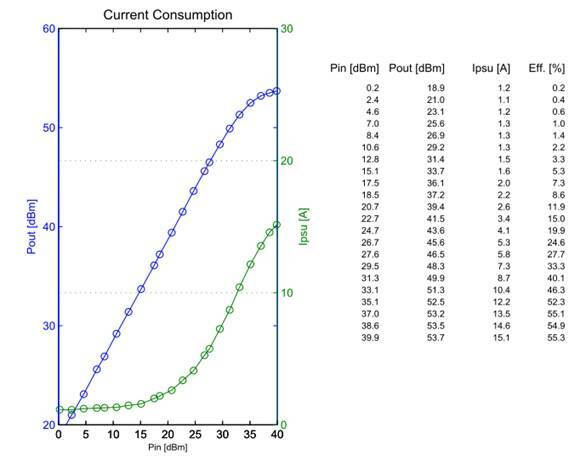 The hybrid couplers required for the assembly of 4 transistors were optimized by simulation. The simulation allows also to evaluate sensitivity of the trace width on the balance of the channels. A few percent of tolerance (typ. 3%) over the width of the branch 90° and 180° and they are quickly unbalanced of a few tenths of dB. The length of lines acts on the resonant frequency. The first prototype is shown below. Coupling balance is very good. A x4 version has then etched to check the performance. 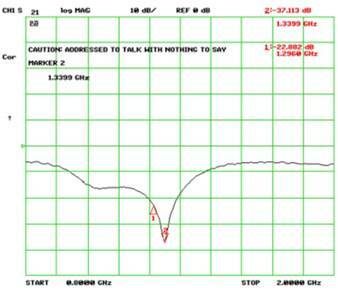 The resonance of the coupler is slightly shifted upward but remains fully usable in 1296 with a return loss of -22dB. Basically the x4 design is a copy and paste of four times the Figure 1 including polarization (Figure 8) and hybrid couplers. The PCB is mechanically split into two to allow mechanical assembly. 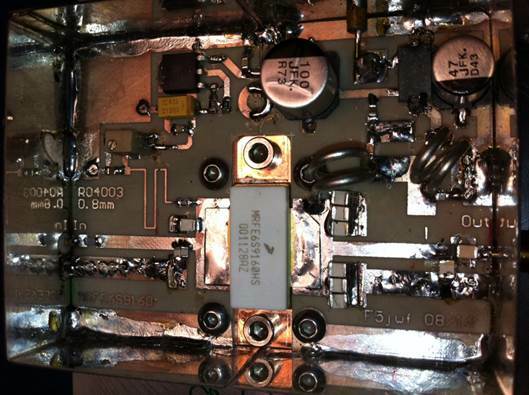 In the middle, the copper plate is inserted with transistors that have been soldered. All other components are mounted on the two PCBs in a first step, and then the two circuits are screwed to the copper plate. At the end the gates and drains are soldered to PCB. Quick tip, reduce the length of the legs of drain and gate to about 3mm of the package and then solder. It makes no difference on performance and it greatly facilitates any subsequent dismantling. • Installation of polarization components of gates and drains following Figure 8 and Figure 9. • Mounting matching and couplings ATC caps as shown in Figure 9. • The inductors have to be made with silver plated copper wire diameter 1.5mm, wound on 6mm drill bit to make 1.5 turns. • The input SMD 50 Ohms loads are soldered directly on the PCB and the output one are screwed on aluminum plate at the end. 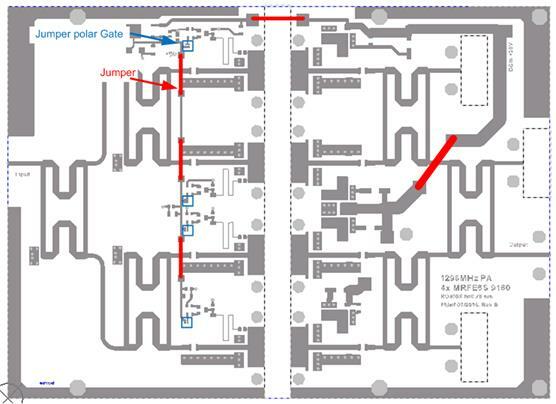 • A few "jumpers " have to be mounted to distribute the gate and drain voltage in the middle of the assembly (see Figure 11). 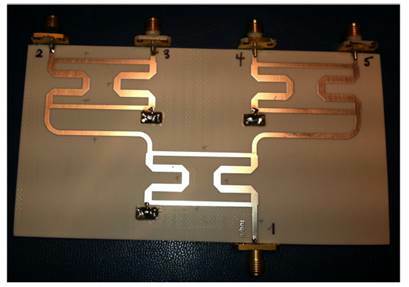 The input and output flanges are done with folded brass sheet to allow soldering the PCB with N connector in order to improve RF transition (Figure 10). The PCB backplane – Flange transition is soldered from below. Are distinguished on the bottom view of Figure 12, the copper plate of the transistors, the aluminum plate which help to dissipate calories from outputs couplers, and the reinforcement piece on input to mechanically secure the assembly. Two lateral flats close the box. Figure 14 and Figure 15 give details of the full assembly. The gate voltage must be set to a drain current of 1.4A per transistor by using potentiometers. 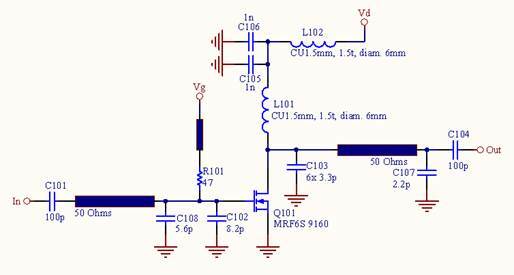 This current corresponds to gate voltage of approximately 3.3V. The current adjustment is a delicate point because the overall intensity of the PA cannot be easily measured. For this purpose, welding jumpers have been included which allow to interrupt the gate voltage and adjust the polarization per stage basis (cf Figure 11). Once the 4 transistors properly biased, low level RF can be injected (typically 100mW ) and measure the gain. In principle, there would be nothing to adjust or retouch and it should peak to about 15 to 18 dB gain. It could possibly be interested to check residual power on the load, using an RF probe and verify that we have between 10 to 15 dB isolation. • Provide cooling accordingly. Efficiency of these devices is only about 40% @1.2GHz. This means that for 1400W (28V 50A) drawn off the power supply, 560W are the RF and 800 are heat that must be dissipated. • You have to find solution to measure such power. I use a 40dB directional coupler and a 1.2GHz 50Ohms load rated for 1kW. • Prepare heavy duty (for serious guys) 28V power supply, the saturation power reaches 630W for a current of 65A. • At the beginning, start with brief transmissions to detect potential problems before the disaster. • Cautions on your fingers, eyes and other attributes, the RF burns and such high levels are not trivial. For my part, I never stay close to PA when running at full power. Optimization is the major difficulty of this assembly because the four-way interact with each other and mismatch occur into saturation region. It is therefore necessary to optimize at maximum power. The position of the caps C107 (C207, C307, C407) play on the output power and on the balance of 4 transistors. Playing with position of these caps to optimize the linear region as large as possible. 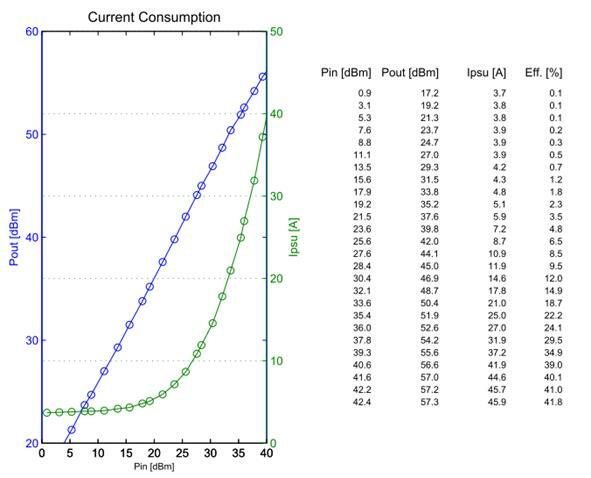 Figure 17 corresponds to the gain curve after optimization. 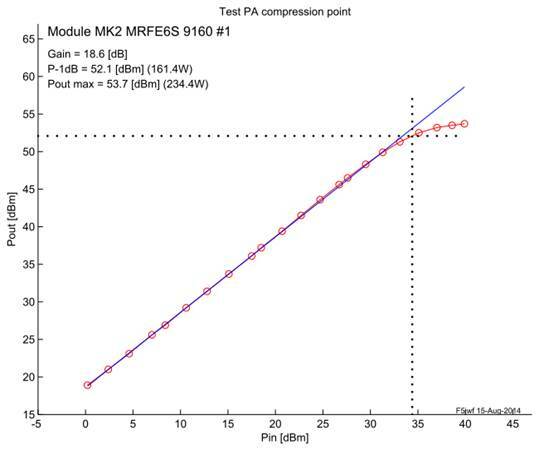 The 1dB compression point is more than 500W with a good linear characteristic. This is the target after optimization. 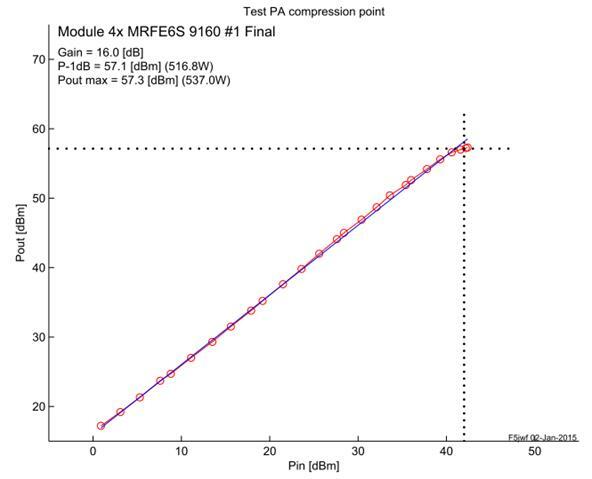 Without this optional step of optimizing, your PA will probably start compression at 400W (P-1dB) to reach its maximum power at 600W which is not very linear but ultimately not a problem operation in EME CW. 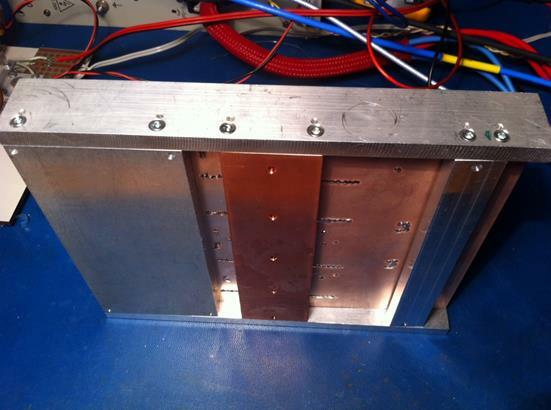 These MRF6S 9160 offer interesting solution for 23cm EME station, the design is compact, transistors are cheap and with a little effort, 500 to 600W can be reached allowing very good echoes with a 3…4m dish. This design is really to be reserved for OM already experienced with RF assemblies. Without such skills you are exposed to profound disillusionment and pain. The 28V power supply is essential. Almost 70A will be required to exceed 600W. Such large currents require special precautions rather unusual in electronics. (Connectors, wire gauges, protections against short circuits, shutdown TX / RX ...). For my part I use the excellent design of 28V power supply by F5UAM which I warmly recommend. A small series of PCB Silvered RO4003 was produced, if you are interested contact me. 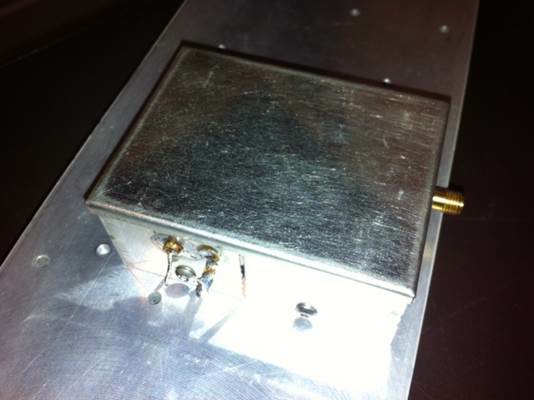 This prototype was mounted in my 23cm EME station with which I operated for the last ARRL EME contest. 20 QSOs CW were made with RST ranging up to 579. The cooling water circulation in the aluminum heat sink is very efficient and the temperature never exceeds 30°C despite sustained transmission for several minutes.